In this week's episode David Wilcock did not at all disappoint when it came to detail and depth of content. Once again, I found it difficult to keep up, and to mentally organize my view of the presentation as it progressed. Though again, I found myself enjoying the challenge. Wilcock started out by reviewing some important details from both the “Wisdom Teachings” series as well as the show “Cosmic Disclosure” (with Corey Goode), on various topics relative to this episode. He discussed the Mars Migration, the evolution of humans on planet Earth, the intervention of the Ra beings, as well as some of the research done by the Secret Space Program on the subject of spontaneous, planetary evolution. One interesting point that David mentioned was relative to these SSP research missions to star systems that had already undergone the energetic changes yet to be seen by planet Earth. He told of how the experiences of the people on these missions were varied. Among these crews, those on the positive path were able to advance in intuitive and psychic ability, while those who were on a negative path quite literally began to lose their minds. Wilcock likened this situation to turning up the thermostat in a room. As the heat would increase, so would the stress of those within that room. Thus, revealing everyone's true colors. Another interesting point that David made was how much care the Ra beings took in respecting free will. At times, this care was to such an extent that they would refuse to give certain details about seemingly simple questions, and would instead remain ambiguous in their answers. Though this ambiguity may be frustrating for some, it draws attention to an important concept. The Law of Free Will dictates that we are all creators of our own experience. If any higher being reveals too much detail of higher knowledge to a being at a critical stage of development (such as where we are now), that higher being could end up dictating the experience of the lower being to them. So instead of that being creating their own experience, the higher being, through their detailed answers, would create the experience for them, thus violating free will. The fact is that the details are ours to fill in as we create our experience, and ultimately learn the lessons of our respective evolutionary state. It is natural for us to be greatly interested in finding the answers to our higher questions. However, these answers were never intended to come directly from someone else. Once again, the journey is ours. Wilcock continued on his working theory that these sphere beings are, in fact, the Ra beings who speak in the Law of One text. He told of how they shared this same ambiguous manner of answering questions (a fact which was confirmed by Corey Goode's independent testimony), and described specific instances of synchronicity that both he and Corey experienced which did not exactly provide the direct answer, but gave very strong hints that these beings were, in fact, the same group. It turns out that this ambiguity has a certain, base principle within the Law of One. David described the principle termed the “Law of Confusion”, by the Ra beings. This law allows free will to fully manifest, in that it allows an element of mystery to be maintained among developing, sentient beings. For instance, if we knew all that we needed to know, there would be virtually no challenge in the experience. We would simply know, and do everything we needed to do in order to progress, but with this element of confusion, we are allowed to experience an aspect of trial and error, in which we are free to make any choice we want before we find our true answer and learn the principles of love and service to others. Another interesting topic to note was that when the Ra/Yahweh beings intervened in the affairs of Earth humans during the second cycle, this was not a normal occurrence. This intervention had to take place because it was seen that humans were not progressing, and if help was not given, ascension and growth would not happen. Consequently, the rules of this Law of Confusion were bent. Here is what the Law of One text says with regard to this progression. 20.18 Questioner: The way I understand it, at the beginning of this 75,000-year cycle, then, we have a mixture of entities— those who have graduated from second density on Earth to become third-density and then a group of entities transferred from the planet Mars to incarnate into third density here. Is this correct? 20.20 Questioner: Thank you. What percentage of the entities, roughly, were— who were in third density here at that time were Martian and what percentage were harvested out of Earth’s second density? 20.21 Questioner: When they incarnated here did they mix— did all three of these types mix together in societies or groups or were they separated by group or society? 20.22 Questioner: Then did this unmixing lend to a possibility of separation of group, then, or the possibility of warlike attitude between groups? 20.23 Questioner: Did this then help to reduce the life span? 20.24 Questioner: Can you tell me why nine hundred years is the optimum life span? 20.25 Questioner: Then at present it would seem that our life span is much too short for those who are new to third-density lessons. Is this correct? 20.26 Questioner: Thank you. Now, back in the first 25,000-year period, or major cycle, what type of aid was given by the Confederation to the entities who were in this 25,000-year period so that they could have the opportunity to grow? So, at the beginning of the first 25,000-year cycle (also the beginning of the 75,000-year cycle) we have this mixture of humans on the planet. Wilcock mentions the fact that, galacticly speaking, this virtually never happens. It has been very rare that such a variety of humans find themselves on the same planet at the same time. The reason this was necessary at the beginning of this cycle was that there were very few civilizations that were successfully graduating from 2nd to 3rd density. This graduation procedure, according to the Law of One, works in such a way as to allow developing humans the opportunity to graduate for one 75,000-year cycle (or three 25,000-year cycles). This is the amount of time a planet can remain in one particular density. If beings do not learn the laws of their particular density after this time period has elapsed, they are “kicked off” of the planet and must continue their lesson elsewhere. At the beginning of this second cycle, Earth was the next “hop” for the beings who had not yet graduated, and at that point, many were still having trouble evolving to the next density. This is why the Ra/Yahweh group sought to intervene. As stated in previous episodes, these Ra/Yahweh beings were tasked with assisting Earth humans in their evolution to higher states of consciousness via the three communications (that is by cloning/bringing them from Mars to Earth, mating with them to produce higher-vibrational offspring, and then speaking to them through different channels who were able to interpret their messages). However, even with this help during the second cycle, very few were able to progress. Though the Law of One does detail how the ancient Chinese were able to activate the fourth chakra (also called the “green-ray center”), which allowed them to embody more of the higher vibration required of 3rd-density graduation. This was also observed to be occurring in ancient Australia, India, Africa, as well as in ancient South America during the second cycle. Here is what the Law of One says regarding these details. 21.28 Questioner: Thank you very much. I apologize for being so stupid in making my questions but this has cleared up the point nicely for me. Thank you. According to the text, at the end of the second major cycle, there were approximately 345,000 people on Earth, and due to the negative pasts of half of the inhabitants, virtually no one was learning and ascending from age to age. To put it more specifically, the negativity that remained from the Martian/Maldecian war, and the subsequent migration to Earth left enough lower-vibrational energy to prevent the descendants of this civilization from progressing. This was partially due to warring between the various human groups (as their cultural differences inevitably kept them divided), and was also a result of the initial quarantine erected by the Ra beings to prevent interference in the development of Earth humans (during the first cycle). Consequently the Yahweh beings, after observing the lack of progress on Earth due to this quarantine, sought to intervene. So at this point, the quarantine was released, and the Earth humans had help via the Three Communications. However, due to the release of this quarantine, negative beings (namely the Draco) were also able to intervene and interfere with evolutionary progress. The Law of One text continues on this subject of intervention. 22.11 Questioner: A very small number. Then as the next cycle started… are these the entities then that stayed to work on the planet? 22.12 Questioner: What type of visit did the Confederation make to this group of 150 entities? 22.13 Questioner: And did all of these entities then decide to stay and help during the next 25,000-year cycle? 22.14 Questioner: Are all of these entities still with us in this cycle? So we see that not many people were harvested at the end of the last 25,000-year cycle. Those who were ready for graduation were the 150 people who were living in South America at the time. Apparently, they were able to learn the value of love, service to others, and enough of the 3rd-density curriculum, allowing them to ascend into the next density. However, many of these people decided to stay after what the Law of One beings described as “a shield of light” appeared to them and communicated telepathically with them. (This may, in fact, be a reference to the archangel, Michael.) As David described it, this being appeared to these people, and through some type of psychic connection, showed them a vision of the laws of 3rd density, and the means by which sentient beings develop and graduate therefrom, as well as the need of Earth humans for higher assistance in this evolutionary process. After experiencing these visions, some of those present decided to remain on the planet, and to assist during the next cycle (this present cycle). There were also those who decided to ascend instead. David concluded with a segue into next week's episode, which is to include the details of what happens at the end of a 25,000-year cycle according to the Law of One. As I said, this episode was jam packed with multiple subjects and subsequent detail. Though it was difficult to sort all of them out in my mind, the challenge is part of the fun. I look forward to next week. 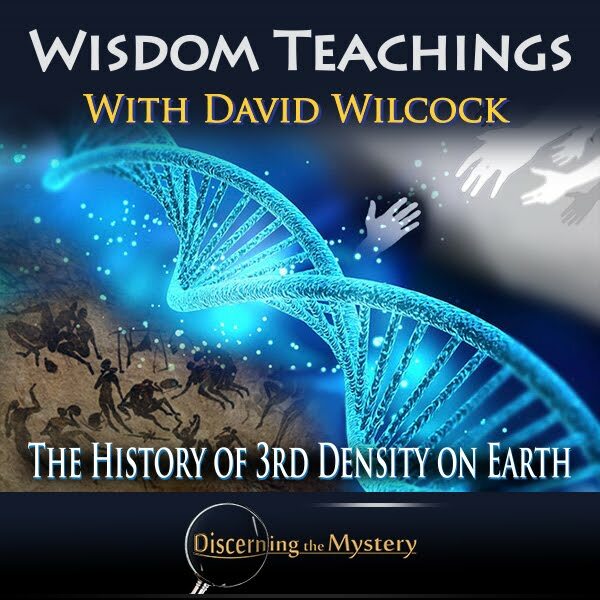 Click here to watch this week's episode, “Wisdom Teachings – The History of 3rd Density on Earth”. For more information on the Law of One, go to http://www.lawofone.info/. Boa noite.Gostaria de saber,tanto de David como de Corey: Quem,ou o que você chamou de diretor solar, se a confederação galáctica é material ou espiritual. Não me espanto com nada mais.Queria saber se podemos confiar na confederação galáctica. Jesus existiu ou não, a que conclusões chegaram após tanta informação? acabei por não ter mais nenhuma crença. Se responder vou ficar muito feliz.